"American Flag" and "Flag of the USA" redirect here. For other uses, see American Flag (disambiguation). For the flag of the United States of the Ionian Islands, see Flag of the United States of the Ionian Islands. The flag of the United States of America, often referred to as the American flag, is the national flag of the United States. 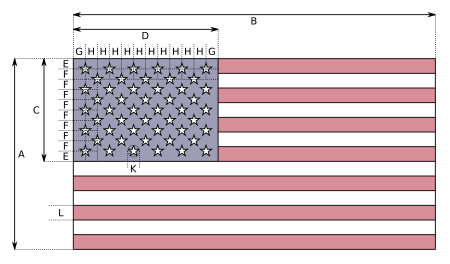 It consists of thirteen equal horizontal stripes of red (top and bottom) alternating with white, with a blue rectangle in the canton (referred to specifically as the "union") bearing fifty small, white, five-pointed stars arranged in nine offset horizontal rows, where rows of six stars (top and bottom) alternate with rows of five stars. The 50 stars on the flag represent the 50 states of the United States of America, and the 13 stripes represent the thirteen British colonies that declared independence from the Kingdom of Great Britain, and became the first states in the U.S. Nicknames for the flag include the Stars and Stripes, Old Glory, and the Star-Spangled Banner. The current design of the U.S. flag is its 27th; the design of the flag has been modified officially 26 times since 1777. The 48-star flag was in effect for 47 years until the 49-star version became official on July 4, 1959. The 50-star flag was ordered by the then president Eisenhower on August 21, 1959, and was adopted in July 1960. It is the longest-used version of the U.S. flag and has been in use for over 58 years. At the time of the Declaration of Independence in July 1776, the Continental Congress would not legally adopt flags with "stars, white in a blue field" for another year. The flag contemporaneously known as "the Continental Colors" has historically been referred to as the first national flag. The Continental Navy raised the Colors as the ensign of the fledgling nation in the American War for Independence—likely with the expedient of transforming their previous British red ensigns by adding white stripes—and would use this flag until 1777, when it would form the basis for the subsequent de jure designs. The name "Grand Union" was first applied to the Continental Colors by George Preble in his 1872 history of the U.S. flag. The flag closely resembles the British East India Company flag of the era, and Sir Charles Fawcett argued in 1937 that the company flag inspired the design. Both flags could have been easily constructed by adding white stripes to a British Red Ensign, one of the three maritime flags used throughout the British Empire at the time. However, an East India Company flag could have from nine to 13 stripes, and was not allowed to be flown outside the Indian Ocean. Benjamin Franklin once gave a speech endorsing the adoption of the Company's flag by the United States as their national flag. He said to George Washington, "While the field of your flag must be new in the details of its design, it need not be entirely new in its elements. There is already in use a flag, I refer to the flag of the East India Company." This was a way of symbolising American loyalty to the Crown as well as the United States' aspirations to be self-governing, as was the East India Company. Some colonists also felt that the Company could be a powerful ally in the American War of Independence, as they shared similar aims and grievances against the British government tax policies. Colonists therefore flew the Company's flag, to endorse the Company. However, the theory that the Grand Union Flag was a direct descendant of the flag of the East India Company has been criticised as lacking written evidence. On the other hand, the resemblance is obvious, and a number of the Founding Fathers of the United States were aware of the East India Company's activities and of their free administration of India under Company rule. In any case, both the stripes (barry) and the stars (mullets) have precedents in classical heraldry. Mullets were comparatively rare in early modern heraldry, but an example of mullets representing territorial divisions predating the U.S. flag are those in the coat of arms of Valais of 1618, where seven mullets stood for seven districts. On June 14, 1777, the Second Continental Congress passed the Flag Resolution which stated: "Resolved, That the flag of the thirteen United States be thirteen stripes, alternate red and white; that the union be thirteen stars, white in a blue field, representing a new constellation." Flag Day is now observed on June 14 of each year. While scholars still argue about this, tradition holds that the new flag was first hoisted in June 1777 by the Continental Army at the Middlebrook encampment. The first official U.S. flag flown during battle was on August 3, 1777, at Fort Schuyler (Fort Stanwix) during the Siege of Fort Stanwix. Massachusetts reinforcements brought news of the adoption by Congress of the official flag to Fort Schuyler. Soldiers cut up their shirts to make the white stripes; scarlet material to form the red was secured from red flannel petticoats of officers' wives, while material for the blue union was secured from Capt. Abraham Swartwout's blue cloth coat. A voucher is extant that Capt. Swartwout of Dutchess County was paid by Congress for his coat for the flag. Francis Hopkinson's flag for the U.S. Navy, featuring 13 six-pointed stars arranged in rows. The 1777 resolution was most probably meant to define a naval ensign. In the late 18th century, the notion of a national flag did not yet exist, or was only nascent. The flag resolution appears between other resolutions from the Marine Committee. On May 10, 1779, Secretary of the Board of War Richard Peters expressed concern "it is not yet settled what is the Standard of the United States." However, the term, "Standard," referred to a national standard for the Army of the United States. Each regiment was to carry the national standard in addition to its regimental standard. The national standard was not a reference to the national or naval flag. The Flag Resolution did not specify any particular arrangement, number of points, nor orientation for the stars and the arrangement or whether the flag had to have seven red stripes and six white ones or vice versa. The appearance was up to the maker of the flag. Some flag makers arranged the stars into one big star, in a circle or in rows and some replaced a state's star with its initial. One arrangement features 13 five-pointed stars arranged in a circle, with the stars arranged pointing outwards from the circle (as opposed to up), the so-called Betsy Ross flag. This flag, however, is more likely a flag used for celebrations of anniversaries of the nation's birthday. Experts have dated the earliest known example of this flag to be 1792 in a painting by John Trumbull. Despite the 1777 resolution, the early years of American independence featured many different flags. Most were individually crafted rather than mass-produced. While there are many examples of 13-star arrangements, some of those flags included blue stripes as well as red and white. Benjamin Franklin and John Adams, in a letter dated October 3, 1778, to Ferdinand I of the Two Sicilies, described the American flag as consisting of "13 stripes, alternately red, white, and blue, a small square in the upper angle, next the flag staff, is a blue field, with 13 white stars, denoting a new Constellation." John Paul Jones used a variety of 13-star flags on his U.S. Navy ships including the well-documented 1779 flags of the Serapis and the Alliance. The Serapis flag had three rows of eight-pointed stars with stripes that were red, white, and blue. The flag for the Alliance, however, had five rows of eight-pointed stars with 13 red and white stripes, and the white stripes were on the outer edges. Both flags were documented by the Dutch government in October 1779, making them two of the earliest known flags of 13 stars. Francis Hopkinson of New Jersey, a naval flag designer, and a signer of the Declaration of Independence, designed the 1777 flag while he was the Chairman of the Continental Navy Board's Middle Department, sometime between his appointment to that position in November 1776 and the time that the flag resolution was adopted in June 1777. The Navy Board was under the Continental Marine Committee. Not only did Hopkinson claim that he designed the U.S. flag, but he also claimed that he designed a flag for the U.S. Navy. Hopkinson was the only person to have made such a claim during his own lifetime, when he sent a letter and several bills to Congress for his work. These claims are documented in the Journals of the Continental Congress and George Hasting's biography of Hopkinson. Hopkinson initially wrote a letter to Congress, via the Continental Board of Admiralty, on May 25, 1780. In this letter, he asked for a "Quarter Cask of the Public Wine" as payment for designing the U.S. flag, the seal for the Admiralty Board, the seal for the Treasury Board, Continental currency, the Great Seal of the United States, and other devices. However, in three subsequent bills to Congress, Hopkinson asked to be paid in cash, but he did not list his U.S. flag design. Instead, he asked to be paid for designing the "great Naval Flag of the United States" in the first bill; the "Naval Flag of the United States" in the second bill; and "the Naval Flag of the States" in the third, along with the other items. The flag references were generic terms for the naval ensign that Hopkinson had designed, that is, a flag of seven red stripes and six white ones. The predominance of red stripes made the naval flag more visible against the sky on a ship at sea. By contrast, Hopkinson's flag for the United States had seven white stripes, and six red ones – in reality, six red stripes laid on a white background. Hopkinson's sketches have not been found, but we can make these conclusions because Hopkinson incorporated different stripe arrangements in the Admiralty (naval) Seal that he designed in the Spring of 1780 and the Great Seal of the United States that he proposed at the same time. His Admiralty Seal had seven red stripes; whereas, his second U.S. Seal proposal had seven white ones. Hopkinson's flag for the Navy is the one that the Nation preferred as the national flag. Remnants of Hopkinson's U.S. flag of seven white stripes can be found in the Great Seal of the United States and the President's seal. When Hopkinson was chairman of the Navy Board, his position was like that of today's Secretary of the Navy. The payment was not made, however, because it was determined he had already received a salary as a member of Congress. This contradicts the legend of the Betsy Ross flag, which suggests that she sewed the first Stars and Stripes flag by request of the government in the Spring of 1776. Furthermore, a letter from the War Board to George Washington on May 10, 1779, documents that there was still no design established for a national flag for the Army's use in battle. The origin of the stars and stripes design has been muddled by a story disseminated by the descendants of Betsy Ross. The apocryphal story credits Betsy Ross for sewing the first flag from a pencil sketch handed to her by George Washington. No evidence for this exists either in the diaries of George Washington nor in the records of the Continental Congress. Indeed, nearly a century passed before Ross' grandson, William Canby, first publicly suggested the story in 1870. By her family's own admission, Ross ran an upholstery business, and she had never made a flag as of the supposed visit in June 1776. Furthermore, her grandson admitted that his own search through the Journals of Congress and other official records failed to find corroboration of his grandmother's story. The family of Rebecca Young claimed that she sewed the first flag. Young's daughter was Mary Pickersgill, who made the Star Spangled Banner Flag. She was assisted by Grace Wisher, an African American girl at just 13 years old. According to rumor, the Washington family coat of arms, shown in a 15th-century window of Selby Abbey, was the origin of the stars and stripes. The 48-star flag was in use from 1912 to 1959, the second longest-used U.S. flag. The current U.S. flag is the longest-used flag, having surpassed the 1912 version in 2007. In 1795, the number of stars and stripes was increased from 13 to 15 (to reflect the entry of Vermont and Kentucky as states of the Union). For a time the flag was not changed when subsequent states were admitted, probably because it was thought that this would cause too much clutter. It was the 15-star, 15-stripe flag that inspired Francis Scott Key to write "Defence of Fort M'Henry", later known as "The Star Spangled Banner", which is now the American national anthem. The flag is currently on display in the exhibition, "The Star-Spangled Banner: The Flag That Inspired the National Anthem" at the Smithsonian Institution National Museum of American History in a two-story display chamber that protects the flag while it is on view. On April 4, 1818, a plan was passed by Congress at the suggestion of U.S. Naval Captain Samuel C. Reid in which the flag was changed to have 20 stars, with a new star to be added when each new state was admitted, but the number of stripes would be reduced to 13 so as to honor the original colonies. The act specified that new flag designs should become official on the first July 4 (Independence Day) following admission of one or more new states. The most recent change, from 49 stars to 50, occurred in 1960 when the present design was chosen, after Hawaii gained statehood in August 1959. Before that, the admission of Alaska in January 1959 prompted the debut of a short-lived 49-star flag. Prior to the adoption of the 48-star flag in 1912, there was no official arrangement of the stars in the canton, although the U.S. Army and U.S. Navy used standardized designs. Throughout the 19th century there was an abundance of different star patterns, rectangular and circular. On July 4, 2007, the 50-star flag became the version of the flag in longest use, surpassing the 48-star flag that was used from 1912 to 1959. When the thirteen stripes and stars first appeared at Canton, much curiosity was excited among the people. News was circulated that a strange ship had arrived from the further end of the world, bearing a flag "as beautiful as a flower". Every body went to see the kwa kee chuen [花旗船; Fākeìsyùhn], or "flower flagship". This name at once established itself in the language, and America is now called the kwa kee kwoh [花旗國; Fākeìgwok], the "flower flag country"—and an American, kwa kee kwoh yin [花旗國人; Fākeìgwokyàhn]—"flower flag countryman"—a more complimentary designation than that of "red headed barbarian"—the name first bestowed upon the Dutch. In the above quote, the Chinese words are written phonetically based on spoken Cantonese. The names given were common usage in the nineteenth and early twentieth centuries. Vietnam has borrowed the term for the United States, as Hoa Kỳ or 花旗 ("Flower Flag") in Vietnamese language. Chinese now refer to the United States as simplified Chinese: 美国; traditional Chinese: 美國; pinyin: Měiguó. Měi is short for Měilìjiān (simplified Chinese: 美利坚; traditional Chinese: 美利堅, phono-semantic matching of "American") and "guó" means "country", so this name is unrelated to the flag. However, the "flower flag" terminology persists in some places today: for example, American Ginseng is called flower flag ginseng (simplified Chinese: 花旗参; traditional Chinese: 花旗參) in Chinese, and Citibank, which opened a branch in China in 1902, is known as Flower Flag Bank (花旗银行). Additionaly, the seal of the Municipal Council of Shanghai International Settlement incorporated the U.S. flag to symbolize the history of American concession. The U.S. flag took its first trip around the world in 1787–90 on board the Columbia. William Driver, who coined the phrase "Old Glory", took the U.S. flag around the world in 1831–32. The flag attracted the notice of Japanese when an oversized version was carried to Yokohama by the steamer Great Republic as part of a round-the-world journey in 1871. 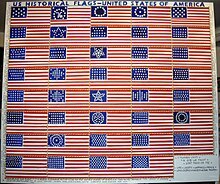 In the following table depicting the 28 various designs of the United States flag, the star patterns for the flags are merely the usual patterns, often associated with the United States Navy. Canton designs, prior to the proclamation of the 48-star flag, had no official arrangement of the stars. Furthermore, the exact colors of the flag were not standardized until 1934. 51-star flags have been designed and used as a symbol by supporters of statehood in various areas. Above is one possible design for a 51-star flag. In the November 2012 U.S. election, Puerto Rico voted to become a U.S. state. However, the legitimacy of the result of this election was disputed. On June 11, 2017, another referendum was held, this time with the result that 97% of voters in Puerto Rico voted for statehood, but it had a turnout of only 23%. Similarly in November 2016, a statehood referendum was held in the District of Columbia where 86% of voters approved the proposal. There have also been repeated calls for some states, most notably California, to split into two or more separate states. If a new U.S. state were to be admitted, it would require a new design on the flag to accommodate the additional star. The flag of the United States is one of the nation's most widely recognized symbols. Within the United States, flags are frequently displayed not only on public buildings but on private residences. The flag is a common motif on decals for car windows, and on clothing ornamentation such as badges and lapel pins. Throughout the world the flag has been used in public discourse to refer to the United States. The flag has become a powerful symbol of Americanism, and is flown on many occasions, with giant outdoor flags used by retail outlets to draw customers. Reverence for the flag has at times reached religion-like fervor: in 1919 William Norman Guthrie's book The Religion of Old Glory discussed "the cult of the flag" and formally proposed vexillolatry. Despite a number of attempts to ban the practice, desecration of the flag remains protected as free speech. Scholars have noted the irony that "[t]he flag is so revered because it represents the land of the free, and that freedom includes the ability to use or abuse that flag in protest". Comparing practice worldwide, Testi noted in 2010 that the United States was not unique in adoring its banner, for the flags of Scandinavian countries are also "beloved, domesticated, commercialized and sacralized objects". For the first time American flags were mass-produced rather than individually stitched and even so, manufacturers could not keep up with demand. As the long winter of 1861 turned into spring, that old flag meant something new. The abstraction of the Union cause was transfigured into a physical thing: strips of cloth that millions of people would fight for, and many thousands die for. These specifications are contained in an executive order which, strictly speaking, governs only flags made for or by the U.S. federal government. In practice, most U.S. national flags available for sale to the public have a different width-to-height ratio; common sizes are 2 × 3 ft. or 4 × 6 ft. (flag ratio 1.5), 2.5 × 4 ft. or 5 × 8 ft. (1.6), or 3 × 5 ft. or 6 × 10 ft. (1.667). Even flags flown over the U.S. Capitol for sale to the public through Representatives or Senators are provided in these sizes. Flags that are made to the prescribed 1.9 ratio are often referred to as "G-spec" (for "government specification") flags. The exact red, white, and blue colors to be used in the flag are specified with reference to the CAUS Standard Color Reference of America, 10th edition. Specifically, the colors are "White", "Old Glory Red", and "Old Glory Blue". The CIE coordinates for the colors of the 9th edition of the Standard Color Card were formally specified in JOSA in 1946. These colors form the standard for cloth, and there is no perfect way to convert them to RGB for display on screen or CMYK for printing. The "relative" coordinates in the following table were found by scaling the luminous reflectance relative to the flag's "white". As with the design, the official colors are only officially required for flags produced for the U.S. federal government, and other colors are often used for mass-market flags, printed reproductions, and other products intended to evoke flag colors. The practice of using more saturated colors than the official cloth is not new. As Taylor, Knoche, and Granville wrote in 1950: "The color of the official wool bunting [of the blue field] is a very dark blue, but printed reproductions of the flag, as well as merchandise supposed to match the flag, present the color as a deep blue much brighter than the official wool." Sometimes, Pantone Matching System (PMS) approximations to the flag colors are used. One set was given on the website of the U.S. embassy in London as early as 1998; the website of the U.S. embassy in Stockholm claimed in 2001 that those had been suggested by Pantone, and that the U.S. Government Printing Office preferred a different set. A third red was suggested by a California Military Department document in 2002. In 2001, the Texas legislature specified that the colors of the Texas flag should be "(1) the same colors used in the United States flag; and (2) defined as numbers 193 (red) and 281 (dark blue) of the Pantone Matching System." A subdued-color flag patch, similar to style worn on the United States Army's ACU uniform. The patch is normally worn reversed on the right upper sleeve. See explanation in "Display on uniforms" section below. When Alaska and Hawaii were being considered for statehood in the 1950s, more than 1,500 designs were submitted to President Dwight D. Eisenhower. Although some of them were 49-star versions, the vast majority were 50-star proposals. At least three of these designs were identical to the present design of the 50-star flag. At the time, credit was given by the executive department to the United States Army Institute of Heraldry for the design. Of these proposals, one created by 17-year-old Robert G. Heft in 1958 as a school project received the most publicity. His mother was a seamstress, but refused to do any of the work for him. He originally received a B– for the project. After discussing the grade with his teacher, it was agreed (somewhat jokingly) that if the flag was accepted by Congress, the grade would be reconsidered. Heft's flag design was chosen and adopted by presidential proclamation after Alaska and before Hawaii was admitted into the Union in 1959. According to Heft, his teacher did keep to their agreement and changed his grade to an A for the project. The 49- and 50-star flags were each flown for the first time at Fort McHenry on Independence Day, in 1959 and 1960 respectively. Traditionally, the flag may be decorated with golden fringe surrounding the perimeter of the flag as long as it does not deface the flag proper. Ceremonial displays of the flag, such as those in parades or on indoor posts, often use fringe to enhance the appearance of the flag. The first recorded use of fringe on a flag dates from 1835, and the Army used it officially in 1895. No specific law governs the legality of fringe, but a 1925 opinion of the attorney general addresses the use of fringe (and the number of stars) "... is at the discretion of the Commander in Chief of the Army and Navy ..." as quoted from footnote in previous volumes of Title 4 of the United States Code law books and is a source for claims that such a flag is a military ensign not civilian. However, according to the Army Institute of Heraldry, which has official custody of the flag designs and makes any change ordered, there are no implications of symbolism in the use of fringe. Several federal courts have upheld this conclusion, most recently and forcefully in Colorado v. Drew, a Colorado Court of Appeals judgment that was released in May 2010. Traditionally, the Army and Air Force use a fringed National Color for parade, color guard and indoor display, while the Sea Services (Navy, Marine Corps and Coast Guard) use a fringeless National Color for all occasions. The flag is customarily flown year-round at most public buildings, and it is not unusual to find private houses flying full-size (3 by 5 feet (0.91 by 1.52 m)) flags. Some private use is year-round, but becomes widespread on civic holidays like Memorial Day, Veterans Day, Presidents' Day, Flag Day, and on Independence Day. On Memorial Day it is common to place small flags by war memorials and next to the graves of U.S. war veterans. Also on Memorial Day it is common to fly the flag at half staff, until noon, in remembrance of those who lost their lives fighting in U.S. wars. The proper stationary vertical display. The union (blue box of stars) should always be in the upper-left corner. The United States Flag Code outlines certain guidelines for the use, display, and disposal of the flag. For example, the flag should never be dipped to any person or thing, unless it is the ensign responding to a salute from a ship of a foreign nation. This tradition may come from the 1908 Summer Olympics in London, where countries were asked to dip their flag to King Edward VII: the American flag bearer did not. Team captain Martin Sheridan is famously quoted as saying "this flag dips to no earthly king", though the true provenance of this quotation is unclear. The Flag Code prohibits using the flag "for any advertising purpose" and also states that the flag "should not be embroidered, printed, or otherwise impressed on such articles as cushions, handkerchiefs, napkins, boxes, or anything intended to be discarded after temporary use". Both of these codes are generally ignored, almost always without comment. Section 8, entitled Respect For Flag states in part: "The flag should never be used as wearing apparel, bedding, or drapery", and "No part of the flag should ever be used as a costume or athletic uniform". Section 3 of the Flag Code defines "the flag" as anything "by which the average person seeing the same without deliberation may believe the same to represent the flag of the United States of America". An additional part of Section 8 Respect For Flag, that is frequently violated at sporting events is part (c) "The flag should never be carried flat or horizontally, but always aloft and free." Although the Flag Code is U.S. federal law, there is no penalty for a private citizen or group failing to comply with the Flag Code and it is not widely enforced—indeed, punitive enforcement would conflict with the First Amendment right to freedom of speech. Passage of the proposed Flag Desecration Amendment would overrule legal precedent that has been established. When the flag is affixed to the right side of a vehicle of any kind (e.g. : cars, boats, planes, any physical object that moves), it should be oriented so that the canton is towards the front of the vehicle, as if the flag were streaming backwards from its hoist as the vehicle moves forward. Therefore, U.S. flag decals on the right sides of vehicles may appear to be reversed, with the union to the observer's right instead of left as more commonly seen. The flag has been displayed on every U.S. spacecraft designed for manned flight, including Mercury, Gemini, Apollo Command/Service Module, Apollo Lunar Module, and the Space Shuttle. The flag also appeared on the S-IC first stage of the Saturn V launch vehicle used for Apollo. But since Mercury, Gemini, and Apollo were launched and landed vertically and were not capable of horizontal atmospheric flight as the Space Shuttle did on its landing approach, the "streaming" convention was not followed and these flags were oriented with the stripes running horizontally, perpendicular to the direction of flight. The NASA Vehicle Assembly Building in 1977. 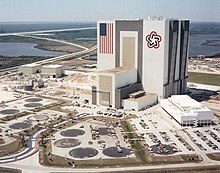 The VAB has the largest U.S. flag ever used on a building, and with the Bicentennial Star opposite the flag. Astronaut Buzz Aldrin salutes the United States flag on the surface of the moon during the Apollo 11 mission. On some U.S. military uniforms, flag patches are worn on the right shoulder, following the vehicle convention with the union toward the front. This rule dates back to the Army's early history, when both mounted cavalry and infantry units would designate a standard bearer, who carried the Colors into battle. As he charged, his forward motion caused the flag to stream back. 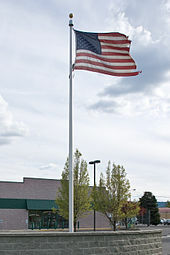 Since the Stars and Stripes are mounted with the canton closest to the pole, that section stayed to the right, while the stripes flew to the left. Several US military uniforms, such as flight suits worn by members of the United States Air Force and Navy, have the flag patch on the left shoulder. Other organizations that wear flag patches on their uniforms can have the flag facing in either direction. The congressional charter of the Boy Scouts of America stipulates that Boy Scout uniforms should not imitate U.S. military uniforms; consequently, the flags are displayed on the right shoulder with the stripes facing front, the reverse of the military style. Law enforcement officers often wear a small flag patch, either on a shoulder, or above a shirt pocket. 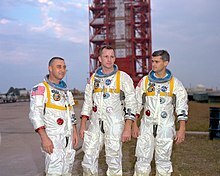 Every U.S. astronaut since the crew of Gemini 4 has worn the flag on the left shoulder of his or her space suit, with the exception of the crew of Apollo 1, whose flags were worn on the right shoulder. In this case, the canton was on the left. The flag did not appear on U.S. postal stamp issues until the Battle of White Plains Issue was released in 1926, depicting the flag with a circle of 13 stars. The 48-star flag first appeared on the General Casimir Pulaski issue of 1931, though in a small monochrome depiction. The first U.S. postage stamp to feature the flag as the sole subject was issued July 4, 1957, Scott catalog number 1094. Since that time the flag has frequently appeared on U.S. stamps. In 1907 Eben Appleton, New York stockbroker and grandson of Lieutenant Colonel George Armistead (the commander of Fort McHenry during the 1814 bombardment) loaned the Star Spangled Banner Flag to the Smithsonian Institution, and in 1912 he converted the loan to a gift. Appleton donated the flag with the wish that it would always be on view to the public. In 1994, the National Museum of American History determined that the Star Spangled Banner Flag required further conservation treatment to remain on public display. In 1998 teams of museum conservators, curators, and other specialists helped move the flag from its home in the Museum's Flag Hall into a new conservation laboratory. Following the reopening of the National Museum of American History on November 21, 2008, the flag is now on display in a special exhibition, "The Star-Spangled Banner: The Flag That Inspired the National Anthem," where it rests at a 10 degree angle in dim light for conservation purposes. By presidential proclamation, acts of Congress, and custom, U.S. flags are displayed continuously at certain locations. Replicas of the Star Spangled Banner Flag (15 stars, 15 stripes) are flown at two sites in Baltimore, Maryland: Fort McHenry National Monument and Historic Shrine and Flag House Square. Marine Corps War Memorial (Raising the Flag on Iwo Jima), Arlington, Virginia. Fifty U.S. flags are displayed continuously at the Washington Monument, Washington, D.C.
At U.S. Customs and Border Protection Ports of Entry that are continuously open. A Civil War era flag (for the year 1863) flies above Pennsylvania Hall (Old Dorm) at Gettysburg College. This building, occupied by both sides at various points of the Battle of Gettysburg, served as a lookout and battlefield hospital. By custom, at the Maryland home, birthplace, and grave of Francis Scott Key; at the Worcester, Massachusetts war memorial; at the plaza in Taos, New Mexico (since 1861); at the United States Capitol (since 1918); and at Mount Moriah Cemetery in Deadwood, South Dakota. 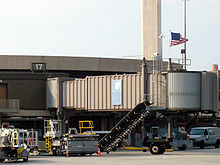 Newark Liberty International Airport's Terminal A, Gate 17 and Boston Logan Airport's Terminal B, Gate 32 and Terminal C, Gate 19 in memoriam of the events of September 11, 2001. Slover Mountain (Colton Liberty Flag), in Colton, California. July 4, 1917, to circa 1952 & 1997 to 2012. At the ceremonial South Pole as one of the 12 flags representing the signatory countries of the original Antarctic Treaty. On the Moon: six manned missions successfully landed at various locations and each had a flag raised at the site. Exhaust gases when the Ascent Stage launched to return the astronauts to their Command Module Columbia for return to Earth blew over the flag the Apollo 11 mission had placed. 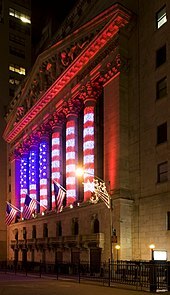 The New York Stock Exchange at Christmas time. An American flag now flies over Gate 17 of Terminal A at Newark Liberty International Airport in Newark, New Jersey, departure gate of United Airlines Flight 93 on 9/11. The flag is displayed at half-staff (half-mast in naval usage) as a sign of respect or mourning. Nationwide, this action is proclaimed by the president; statewide or territory-wide, the proclamation is made by the governor. In addition, there is no prohibition against municipal governments, private businesses or citizens flying the flag at half-staff as a local sign of respect and mourning. However, many flag enthusiasts feel this type of practice has somewhat diminished the meaning of the original intent of lowering the flag to honor those who held high positions in federal or state offices. President Dwight D. Eisenhower issued the first proclamation on March 1, 1954, standardizing the dates and time periods for flying the flag at half-staff from all federal buildings, grounds, and naval vessels; other congressional resolutions and presidential proclamations ensued. However, they are only guidelines to all other entities: typically followed at state and local government facilities, and encouraged of private businesses and citizens. To properly fly the flag at half-staff, one should first briefly hoist it top of the staff, then lower it to the half-staff position, halfway between the top and bottom of the staff. Similarly, when the flag is to be lowered from half-staff, it should be first briefly hoisted to the top of the staff. First Sunday in October: Start of Fire Prevention Week, in honor of the National Fallen Firefighters Memorial Service. For 10 days: Death of a vice president, Supreme Court chief justice/retired chief justice, or speaker of the House of Representatives. From death until the day of interment: Supreme Court associate justice, member of the Cabinet, former vice president, president pro tempore of the Senate, or the majority and minority leaders of the Senate and House of Representatives. Also for federal facilities within a state or territory, for the governor. National Korean War Veterans Armistice Day, on July 27, was formerly a day of half-staff observance until the law expired in 2003. In 2009, it became a day of full-staff observance. Begin by holding it waist-high with another person so that its surface is parallel to the ground. Fold the lower half of the stripe section lengthwise over the field of stars, holding the bottom and top edges securely. Fold the flag again lengthwise with the blue field on the outside. Make a rectangular fold then a triangular fold by bringing the striped corner of the folded edge to meet the open top edge of the flag, starting the fold from the left side over to the right. Turn the outer end point inward, parallel to the open edge, to form a second triangle. The triangular folding is continued until the entire length of the flag is folded in this manner (usually thirteen triangular folds, as shown at right). On the final fold, any remnant that does not neatly fold into a triangle (or in the case of exactly even folds, the last triangle) is tucked into the previous fold. When the flag is completely folded, only a triangular blue field of stars should be visible. There is also no specific meaning for each fold of the flag. However, there are scripts read by non-government organizations and also by the Air Force that are used during the flag folding ceremony. These scripts range from historical timelines of the flag to religious themes. Traditionally, the flag of the United States plays a role in military funerals, and occasionally in funerals of other civil servants (such as law enforcement officers, fire fighters, and U.S. presidents). A burial flag is draped over the deceased's casket as a pall during services. Just prior to the casket being lowered into the ground, the flag is ceremonially folded and presented to the deceased's next of kin as a token of respect. The flag of Bikini Atoll is symbolic of the islanders' belief that a great debt is still owed to the people of Bikini because in 1954 the United States government detonated a thermonuclear bomb on the island as part of the Castle Bravo test. The flag of Liberia bears a close resemblance, showing the ex-American-slave origin of the country. The Liberian flag has 11 similar red and white stripes, which stand for the 11 signers of the Liberian Declaration of Independence, as well as a blue square with only a single large white star for the canton. The flag of Liberia is the only flag in the world that was modeled after and resembles the American flag because Liberia was the only nation in the world that was founded, colonized, established, and controlled by freed African American and ex-caribbean slaves as settlers who came from the United States and the Caribbean islands as a homeland to live, with the help and support from the American Colonization Society on January 7, 1822. Despite Malaysia having no historical connections with the U.S., the flag of Malaysia greatly resembles the U.S. flag. It is possible that the flag of the British East India Company influenced both the Malaysian and U.S. flag. The flag of El Salvador from 1865 to 1912. A different flag was in use, based on the flag of the United States, with a field of alternating blue and white stripes and a red canton containing white stars. The flag of Brittany was inspired in part by the American flag. William Driver (1803–1886), who owned and named "Old Glory"
Francis Scott Key (1779–1843), writer of "The Star-Spangled Banner"
Allentown Art Museum. The American Flag in the Art of Our Country. Allentown Art Museum, 1976. Herbert Ridgeway Collins. Threads of History: Americana Recorded on Cloth 1775 to the Present. Smithsonian Institution Press, 1979. Grace Rogers Cooper. Thirteen-star Flags: Keys to Identification. Smithsonian Institution Press, 1973. David D. Crouthers. Flags of American History. Hammond, 1978. Louise Lawrence Devine. The Story of Our Flag. Rand McNally, 1960. William Rea Furlong, Byron McCandless, and Harold D. Langley. So Proudly We Hail: The History of the United States Flag. Smithsonian Institution Press, 1981. George E. Hastings. The Life and Works of Francis Hopkinson. University of Chicago Press, 1926. Kevin Keim & Peter Keim. A Grand Old Flag: A History of the United States through its Flags. DK Publishing. 2007. ISBN 978-0-7566-2847-5. Flag: An American Biography. Thomas Dunne Books/St. Martin's Press, 2005. David Roger Manwaring. Render Unto Caesar: The Flag-Salute Controversy. University of Chicago Press, 1962. Boleslaw Mastai and Marie-Louise D'Otrange Mastai. The Stars and the Stripes: The American Flag as Art and as History from the Birth of the Republic to the Present. Knopf, 1973. Henry W. Moeller, Ph.D. "Two Early American Ensigns on the Pennsylvania State Arms." NAVA News, Issue 173, Jan.–Mar. 2002. Milo Milton Quaife. The Flag of the United States. 1942. Milo Milton Quaife, Melvin J. Weig, and Roy Applebaum. The History of the United States Flag, from the Revolution to the Present, Including a Guide to Its Use and Display. Harper, 1961. Richard S. Patterson and Richardson Dougall. The Eagle and the Shield: A History of the Great Seal of the United States. U.S. Government Printing Office, 1978 [1976 i.e. 1978]. Albert M. Rosenblatt. "Flag Desecration Statutes: History and Analysis", Washington University Law Quarterly 1972: 193–237. George and Virginia Schaun. "Historical Portrait of Mrs. Mary Young Pickersgill." The Greenberry Series on Maryland, Greenberry Publications. Volume 5. Leonard A. Stevens. Salute! The Case of The Bible vs. The Flag. Coward, McCann & Geoghegan, 1973. Arnaldo Testi. Capture the Flag: The Stars and Stripes in American History (New York University Press; 2010) 192 pages. A European perspective on the symbolism and political, social, and cultural significance of the flag. Earl P. Williams Jr. " " NAVA News, Issue 216, Oct.–Dec. 2012. Paul M. Zall. "Comical Spirit of Seventy-Six: The Humor of Francis Hopkinson." The Huntington Library, 1976. Chadwick, Patricia. "The Women Behind the Flag"
^ John Warner (1998). "Senate Concurrent Resolution 61" (PDF). U.S Government Printing Office. Retrieved April 5, 2014. ^ "History of the American Flag". www.infoplease.com. Retrieved December 13, 2015. ^ "USFlag.org: A website dedicated to the Flag of the United States of America - "OLD GLORY!"". www.usflag.org. Retrieved December 13, 2015. ^ Duane Streufert. "A website dedicated to the Flag of the United States of America – The 50 Star Flag". USFlag.org. Retrieved September 12, 2013. ^ a b Leepson, Marc (2004). Flag: An American Biography. ^ a b Ansoff, Peter (2006). "The Flag on Prospect Hill" (PDF). Raven: A Journal of Vexillology. 13: 91–98. doi:10.5840/raven2006134. Archived from the original (PDF) on February 5, 2015. ^ Johnson, Robert (2006). Saint Croix 1770–1776: The First Salute to the Stars and Stripes. AuthorHouse. p. 71. ISBN 978-1425970086. ^ Horton, Tom (2014). "Exposing the Origins of Old Glory's stripes". History's Lost Moments: The Stories Your Teacher Never Told You. 5. Trafford Publishing. ISBN 978-1490744698. ^ a b "Saltires and Stars & Stripes". The Economic Times. Retrieved 2017-05-23. ^ "Journals of the Continental Congress, 1774–1789, 8:464". ^ Connell, R.W; Mack, W.P (2004). Naval Ceremonies, Customs, and Traditions. Naval Institute Press. p. 140. ISBN 978-1-55750-330-5. Retrieved October 27, 2014. ^ Furlong, Rear Admiral William Rea; McCandless, Commodore Byron (1981). So Proudly We Hail. Washington, D.C: Smithsonian Institution Press. pp. 115–16. ^ a b Williams Jr., Earl P. (October 2012). "Did Francis Hopkinson Design Two Flags?" (PDF). NAVA News (216): 7–9. Retrieved February 16, 2017. ^ Lane, Megan (November 14, 2011). "Five hidden messages in the American flag". BBC News. Retrieved October 30, 2013. ^ Cooper, Grace Rogers (1973). Thirteen-Star Flags. Washington, D.C.: Smithsonian Institution Press. ^ Cooper, Grace Rogers (1973). Thirteen-Star Flags. Washington, D.C.: Smithsonian Institution Press. pp. 9 (in paper), pp. 21/80 (in pdf). CiteSeerX 10.1.1.639.8200. In 1792, Trumbull painted thirteen stars in a circle in his General George Washington at Trenton in the Yale University Art Gallery. In his unfinished rendition of the Surrender of Cornwallis at Yorktown,8 date not established, the circle of stars is suggested and one star shows six points while the thirteen stripes are of red, white, and blue. How accurately the artist depicted the star design that he saw is not known. At times, he may have offered a poetic version of the flag he was interpreting which was later copied by the flag maker. The flag sheets and the artists do not agree. ^ Cooper, Grace Rogers (1973). Thirteen-Star Flags. Washington, D.C: Smithsonian Institution Press. p. 3. ^ Moeller, Henry W (1992). Unfurling the History of the Stars and Stripes. Mattituck, NY: Amereon House. pp. 25–26, color plates 5A, 5B. ^ Hess, Debra (2008). The American Flag. Benchmark Books. p. 21. ISBN 978-0-7614-3389-7. ^ Hastings, George E. (1926). The Life and Works of Francis Hopkinson. Chicago: University of Chicago Press. p. 218. ^ a b Williams, pp. 7–9. ^ Moeller, Henry W., Ph.D. (January 2002). "Two Early American Ensigns on the Pennsylvania State Arms". NAVA News (173): 4. ^ Patterson, Richard Sharpe; Dougall, Richardson (1978) [1976 i.e. 1978]. The Eagle and the Shield: A History of the Great Seal of the United States. Department and Foreign Service series; 161 Department of State publication; 8900. Washington : Office of the Historian, Bureau of Public Affairs, Dept. of State : for sale by the Supt. of Docs., U.S. Govt. Print. Off. p. 37. LCCN 78602518. OCLC 4268298. ^ Zall, Paul M. (1976). Comical Spirit of Seventy-Six: The Humor of Francis Hopkinson. San Marino, California: Huntington Library. p. 10. ^ "Journals of the Continental Congress – Friday, October 27, 1780". Library of Congress. Retrieved September 3, 2010. ^ Furlong, William Rea; McCandless, Byron (1981). So Proudly We Hail : The History of the United States Flag. Washington, D.C.: Smithsonian Institution Press. pp. 98–101. ISBN 978-0-87474-448-4. ^ Federal Citizen Information Center: The History of the Stars and Stripes. Retrieved June 7, 2008. ^ Embassy of the United States of America . Retrieved April 11, 2008. ^ Furlong, William Rea; McCandless, Byron (1981). So Proudly We Hail : The History of the United States Flag. Washington, D.C.: Smithsonian Institution Press. pp. 117–118. ISBN 978-0-87474-448-4. ^ Crews, Ed. "The Truth About Betsy Ross". Retrieved June 27, 2009. ^ Canby, George; Balderston, Lloyd (1917). The Evolution of the American flag. Philadelphia: Ferris and Leach. pp. 48, 103. ^ Canby, William J. "The History of the Flag of the United States: A Paper read before the Historical Society of Pennsylvania (March 1870)". Independence Hall Association. Archived from the original on February 20, 2015. Retrieved February 24, 2015. ^ Schaun, George and Virginia. "Historical Portrait of Mrs. Mary Young Pickersgill". The Greenberry Series on Maryland. Annapolis, MD: Greenberry Publications. 5: 356. ^ Furlong, William Rea; McCandless, Byron (1981). So Proudly We Hail : The History of the United States Flag. Washington, D.C.: Smithsonian Institution Press. p. 137. ISBN 978-0-87474-448-4. ^ "The Star-Spangled Banner: Making the Flag". National Museum of American History. Smithsonian Institution. Retrieved October 5, 2009. ^ Yuen, Helen and Asantewa Boakyewa. "The African American girl who helped make the Star-Spangled Banner". O Say Can You See?. Smithsonian. Retrieved 9 October 2018. ^ "Washington Window". Retrieved April 25, 2013. ^ a b "The Star-Spangled Banner Online Exhibition". National Museum of American History, Smithsonian Institution. Retrieved April 4, 2012. ^ United States Government (1861). Our Flag (PDF). Washington D.C.: United States Government Printing Office. S. Doc 105-013. ^ "United States Flag History". United States Embassy. Archived from the original on February 25, 2008. Retrieved February 3, 2009. ^ Preble, George Henry (1880). History of the Flag of the United States of America (second revised ed.). Boston: A. Williams and Co. p. 298. ^ a b c Tappan, Eva March (1917). The Little Book of the Flag. Boston: Houghton Mifflin Company. p. 92. ^ Kwoh, Choong (June 15, 1843). "Curiosa Sinica". Boston Courier. ^ "Chinese Etymologies". Kendall's Expositor. 3 (14). Washington, D.C.: William Greer. June 27, 1843. p. 222 – via Google Books. Olsen, Kay Melchisedech, Chinese Immigrants: 1850–1900 (2001), p. 7. "Philadelphia's Chinatown: An Overview", The Historical Society of Pennsylvania. ^ Leepson, Marc. (2005). Flag: An American Biography. New York: St. Martin's Press. ^ "CEE Event". resultados2017.ceepur.org. Retrieved October 15, 2017. ^ "Puerto Rico Overwhelmingly Votes On U.S. Statehood In Nonbinding Referendum". Npr.org. Retrieved October 15, 2017. ^ "4 U.S. Code § 2 - Same; additional stars". LII / Legal Information Institute. Retrieved January 20, 2017. ^ "What the American Flag Symbolizes Around The World". December 28, 2018. Retrieved January 30, 2019. ^ Guthrie, William Norman (1919). The Religion of Old Glory (reprint ed.). New York: George H. Doran Company. p. 370. ISBN 9781178236354. Retrieved 2018-04-27. ^ The Flag Bulletin. 23. Winchester, Massachusetts: Flag Research Center. 1984. p. 107. Retrieved 2018-04-27. [...] a formal book-length proposal for vexillolatry was made by William Norman Guthrie in his The Religion of Old Glory (New York: Doran, l9l9). ^ Arnaldo Testi, Capture the Flag: The Stars and Stripes in American History (New York University Press, 2010), p. 2, ISBN 978-0-8147-8322-1. ^ Adam Goodheart (2011). Prologue. 1861: The Civil War Awakening. Knopf Doubleday Publishing Group. ISBN 978-0-307-59666-6. Retrieved July 31, 2015 – via adamgoodheart.com. ^ Note that the flag ratio (B/A in the diagram) is not absolutely fixed. Although the diagram in Executive Order 10834 gives a ratio of 1.9, earlier in the order is a list of flag sizes authorized for executive agencies. This list permits eleven specific flag sizes (specified by height and width) for such agencies: 20.00 × 38.00; 10.00 × 19.00; 8.95 × 17.00; 7.00 × 11.00; 5.00 × 9.50; 4.33 × 5.50; 3.50 × 6.65; 3.00 × 4.00; 3.00 × 5.70; 2.37 × 4.50; and 1.32 × 2.50. Eight of these sizes conform to the 1.9 ratio, within a small rounding error (less than 0.01). However, three of the authorized sizes vary significantly: 1.57 (for 7.00 × 11.00), 1.27 (for 4.33 × 5.50) and 1.33 (for 3.00 × 4.00). ^ Ex. Ord. No. 10834, August 21, 1959, 24 F.R. 6865 (governing flags "manufactured or purchased for the use of executive agencies", Section 22). Section 32 explains that, "As used in this order, the term 'executive agencies' means the executive departments and independent establishments in the executive branch of the Government, including wholly owned Government corporations." ^ Architect of the Capitol: "Flag Request Form", retrieved on July 1st, 2017. ^ General Services Administration "Federal Specification DDD-F-416F: Flag, National, United States of America and Flag, Union Jack". March 31, 2005. ^ Genevieve Reimann, Deane B. Judd, and Harry J. Keegan (1946). "Spectrophotometric and Colorimetric Determination of the Colors of the TCCA Standard Color Cards". JOSA 36 (3), 128–159. ^ In the 9th edition of the Standard Color Card of America, "White", "Old Glory Red", and "Old Glory Blue" were, respectively, Cable No. 70001, Cable No. 70180, and Cable No. 70075. The Munsell renotation coordinates for these were taken directly from the Reimann et al. paper, the CIELAB D65 coordinates were found by converting the xyY values in that paper to be relative to CIE Illuminant D65 from Illuminant C using the CAT02 chromatic adaptation transform, and relative to a perfect diffuse reflector as white. The "relative" values in the table were found by taking Cable No. 70001's luminosity to be that of the white point, and were converted to D65 or D50 also using the CAT02 transformation. The values for CMYK were found by converting from the CIELAB D50 values using the Adobe CMM and the GRACoL 2006 ICC profile in Adobe Photoshop. ^ Helen Taylor, Lucille Knoche, and Walter Granville, eds. (1950), Descriptive Color Names Dictionary. Container Corporation of America. ^ In 1998, "U.S. Flag Facts" at the website of the U.S. embassy in London listed the colors red PMS 193 and blue PMS 282 (presumably PMS solid coated colors). By October 2002, these had changed to red PMS 193 and blue PMS 281. These latter PMS equivalents are listed on many websites including various other U.S. Government organizations, such as the Millennium Challenge Corporation's website Archived May 22, 2010, at the Wayback Machine. See also "United States of America" Archived July 13, 2010, at the Wayback Machine, Flags of the World. The website of the U.S. Embassy in Stockholm instead lists PMS 186 and PMS 288 as the colors specified by the U.S. Government Printing Office: "Colors of the U.S. Flag". United States Embassy Stockholm. November 2001. The Military Department of the State of California suggested PMS 200 for red in a 2002 document, "Flags over California, a history and guide". ^ The Government Code; Title 11. State Symbols and Honors; Subtitle A; Chapter 3100. Statutes.legis.state.tx.us. Retrieved on May 27, 2011. ^ The values in this table were taken by converting the CIELAB D50 coordinates for PMS 193 C, 200 C, and 281 C given in the Pantone color palettes of Adobe Photoshop to sRGB and GRACoL using the Adobe CMM and the GRACoL 2006 and sRGB profiles in Photoshop. Since PMS 281 C (blue) is outside the gamut of sRGB, and both PMS 281 C and PMS 183 C (red) are outside the gamut of GRACoL, the RGB and CMYK values for those in the table below are necessarily less-colorful approximations to the colors of the Pantone swatches. ^ These designs are in the Eisenhower Presidential Archives in Abilene, Kansas. Only a small fraction of them have ever been published. ^ "Robert G. Heft: Designer of America's Current National Flag". USFlag.org: A website dedicated to the Flag of the United States of America. Retrieved December 7, 2006. ^ a b Rasmussen, Frederick N. (July 3, 2010). "A half-century ago, new 50-star American flag debuted in Baltimore". The Baltimore Sun. ^ "Fringe on the American Flag". Archived from the original on September 11, 2006. Retrieved June 27, 2006. ^ See McCann v. Greenway, 952 F. Supp. 647 (W.D. Mo. 1997), which discusses various court opinions denying any significance related to trim used on a flag. ^ Rebuttal of "martial law flag" claims by tax protesters. Evans-legal.com. Retrieved on May 27, 2011. ^ "state.co.us: "COLORADO COURT OF APPEALS – ORDER AFFIRMED: Colorado v Drew" (Munsinger) 13 May 2010" (PDF). courts.state.co.us. Retrieved April 19, 2015. ^ LA84 Foundation. (PDF). Retrieved on May 27, 2011. ^ London Olympics 1908 & 1948. Web.archive.org. Retrieved on May 27, 2011. ^ "Consider Recycling, not Burning, a Retired Flag". Boy Scouts of America. 2012. Retrieved July 6, 2012. ^ 4 U.S.Code Sec. 8(i). ^ 4 U.S.Code Chapter 1 Sec. 3. ^ Texas v. Johnson, 491 U.S. 397 (1989); United States v. Eichman, 496 U.S. 310 (1990). ^ About.com. Usmilitary.about.com (October 1, 2005). Retrieved on May 27, 2011. ^ "SUBJECT: Air Force Guidance Memorandum to AFI 36-2903, Dress and Personal Appearance of Air Force Personnel" (PDF). Static.e-publishing.af.mil. Retrieved 15 October 2017. ^ "Navy aviators ditch new flight suit wear rules". Navytimes.com. Retrieved October 27, 2014. ^ Self, Peter (March 11, 2014). "Is the American flag 'backward' on Scout uniforms?". Scoutingmagazine.org. Scouting. Retrieved November 18, 2014. Imitation of United States Army, Navy or Marine Corps uniforms is prohibited, in accordance with the provisions of the organization's Congressional Charter. ^ Scott's Specialized Catalogue of United States Postage Stamps. ^ Presidential Proclamation No. 2795, July 2, 1948 Code of Federal Regulations of the United States, Title 3 Compilation (1943–1948), HathiTrust, Google Books/University of Michigan scan, pages 212–213. ^ Public Law 83-319, approved March 26, 1954. ^ Presidential Proclamation No. 3418, June 12, 1961. ^ Public Law 89-335, approved November 8, 1965. ^ Presidential Proclamation No. 4000, September 4, 1970. ^ Presidential Proclamation No. 4064, July 6, 1971, effective July 4, 1971. ^ Presidential Proclamation No. 4131, May 5, 1972. ^ Gettysburg College – News Detail Archived June 17, 2010, at the Wayback Machine. Gettysburg.edu. Retrieved on May 27, 2011. ^ Pub. L. 94−53, 89 Stat. 259, S.J.Res. 98, approved July 4, 1975. ^ "Patrick Madrid: My visit to Gate 32 at Boston's Logan Airport". patrickmadrid.blogspot.com. Retrieved October 27, 2014. ^ With the consent of Congress, Old Glory kept perpetual shine Archived July 17, 2011, at the Wayback Machine, PE Press Archive. ^ "Calportland Media Center". Calportland.com. Retrieved October 15, 2017. ^ Clara Moskowitz (July 27, 2012). 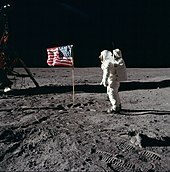 "Apollo Moon Landing Flags Still Standing, Photos Reveal". Space.com. Retrieved January 14, 2019. ^ "4 U.S. Code § 6 - Time and occasions for display". LII / Legal Information Institute. Retrieved October 15, 2017. ^ a b c Pub.L. 111-41. 123 Stat. 1962, H.R. 2632, approved July 27, 2009. Retrieved on October 4, 2013. ^ "36 U.S. Code § 111 - Gold Star Mother's Day". LII / Legal Information Institute. Retrieved October 15, 2017. ^ MDVA: Flag Information. Mdva.state.mn.us. Retrieved on May 27, 2011. ^ US Code, Title 4, Chapter 1, §7. ^ 36 U.S.C. Sec. 136. None. Retrieved on May 27, 2011. ^ Patriot Day, 2005. Georgewbush-whitehouse.archives.gov. Retrieved on May 27, 2011. ^ Public Law 107-51. Ushistory.org. Retrieved on May 27, 2011. ^ Presidential Proclamation Fire Prevention Week | The White House Archived October 31, 2009, at the Wayback Machine. Whitehouse.gov. Retrieved on May 27, 2011. ^ National Pearl Harbor Remembrance Day, 2007. Georgewbush-whitehouse.archives.gov. Retrieved on May 27, 2011. ^ "Flag-Folding Procedures | The American Legion". Legion.org. Retrieved September 8, 2013. ^ "Sequence of Events for an Army Honors Funeral At Arlington National Cemetery". Arlington National Cemetery. Archived from the original on January 25, 2009. Retrieved February 6, 2009. ^ "Flag Presentation Protocol". Virginia Army National Guard. Archived from the original on May 11, 2009. Retrieved February 6, 2009. ^ "Bikinian Anthem & Flag". Bikiniatoll.com. March 1, 1954. Retrieved September 8, 2013. ^ "President Sirleaf Worships at Abyssinian Baptist Church; Pleads with African Americans to Serve as Ambassadors for Liberia". Ministry of State Presidential Affairs, Executive Mansion, Government of Liberia. September 23, 2012. Retrieved July 16, 2014. ^ Regionalism after Regionalisation (AUP Dissertation Series). Amsterdam University Press; 01 edition (9 Feb. 2014). 2014. p. 223. ISBN 978-9056294281. "Identity and Marking Standards" (PDF). Office of the Under Secretary for Public Diplomacy and Public Affairs. Washington, D.C.: United States Department of State. June 2012. Archived from the original (PDF) on February 14, 2013. Retrieved February 14, 2013. This page was last edited on 18 April 2019, at 20:20 (UTC).